When many of us think of narcolepsy, an image of the narcoleptic weiner dog or Homer Simpson nodding off at inopportune times might come to mind. But for those with the condition, narcolepsy is inconvenient, disruptive and dangerous. For those that suffer from narcolepsy, there are many risks associated with the condition. 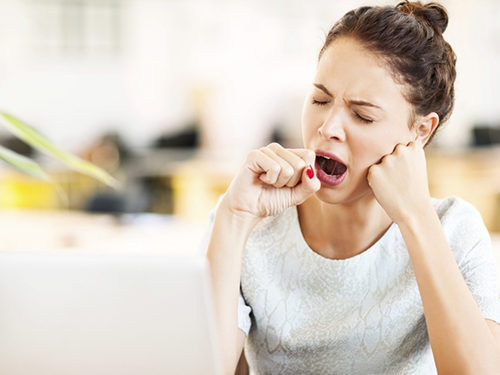 Becoming excessively sleepy at any time without warning can affect our personal and professional lives. Our lives can even be put at risk when “sleep attacks” occur during important tasks like driving a car. To potentially avoid having this happen to you, here are a few tips that could prove to be beneficial in better managing symptoms associated with narcolepsy. The foods that you consume could greatly affect the severity of your narcoleptic symptoms. It is important to avoid carbohydrates and sugars. This means avoiding starchy fruits and vegetables (corn, potatoes, bananas). It may also be beneficial to avoid grains (bread, pasta) and sugars (candy, table sugar, honey). It’s also important to avoid nicotine and alcohol as they can worsen your symptoms. It is very important for you to exercise 4-5 times a week. This regularity in physical activity will help stimulate your body and mind while increasing your daily energy. Go to sleep and wake up at the same time every day. This could help train your body to know understand when it is acceptable/unacceptable to feel tired. Implementing regular intervals of 15-20 minute naps could also prove to be beneficial as they should keep you rested for 1-3 hours. If you have tried these methods but are still struggling with your narcoleptic symptoms, a research opportunity at Clinical Trials of Florida may be an option. 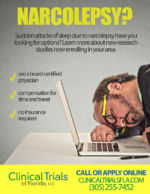 By helping us test a potential new medication for narcolepsy, you could receive free hands-on care from a board certified physician, as well as compensation for your time and travel. Apply here for a research opportunity in your area!